There is plenty of parking near the entrance sign at the Northeast Entrance of Badlands National Park. Even after our visit to Badlands National Park, I am still at a loss to describe the area well. As I tried to imagine westward settlers viewing this area for the first time, all I could think was that to many it would seem that the flat, grassy prairie gave way to an other-worldly landscape of buttes and bluffs filled with animals they had never seen before. 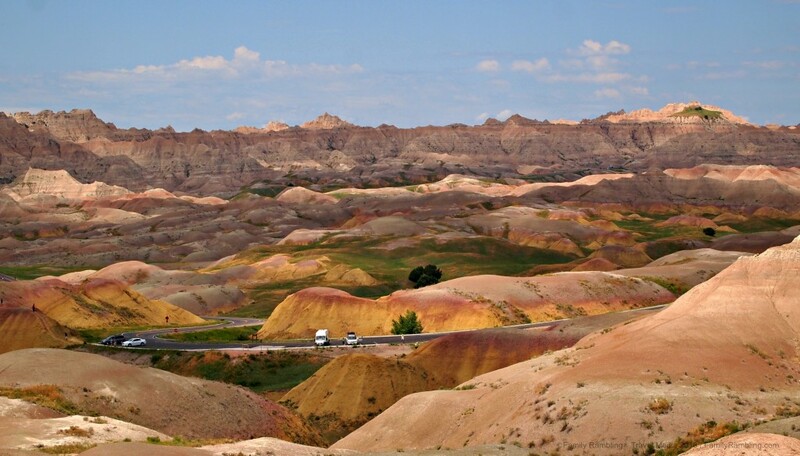 There are a few entrances into Badlands National Park, though most visitors enter at the Northeast and Pinnacles entrances, both just south of I-90. Running between these two entrances is the Cedar Loop Road, the best maintained road through the park and the road that was recommended to us as we were pulling a camper. Very few roads run through the Badlands, with a single main road running through the North Unit and no marked roads through the Stronghold and Palmer Creek Units (both located within the Pine Ridge Indian Reservation), the Badlands seem practically untouched by humans. Even at these busy spots, you’ll want to watch where you walk. Once off the main road, the Badlands stretch wide in front of you, miles of barren landscape with short grasses, dry and hot, desolate and a bit eerie. Once off road, your only transportation is by foot. Eight hiking paths are well marked and great for families. We made time to hike the short Fossil Exhibit Trail. This completely boardwalked pathway features enclosed fossil exhibits that have been found in the parkland. But the real draw is the easy- and not so easy- climbs on the smaller surrounding buttes. 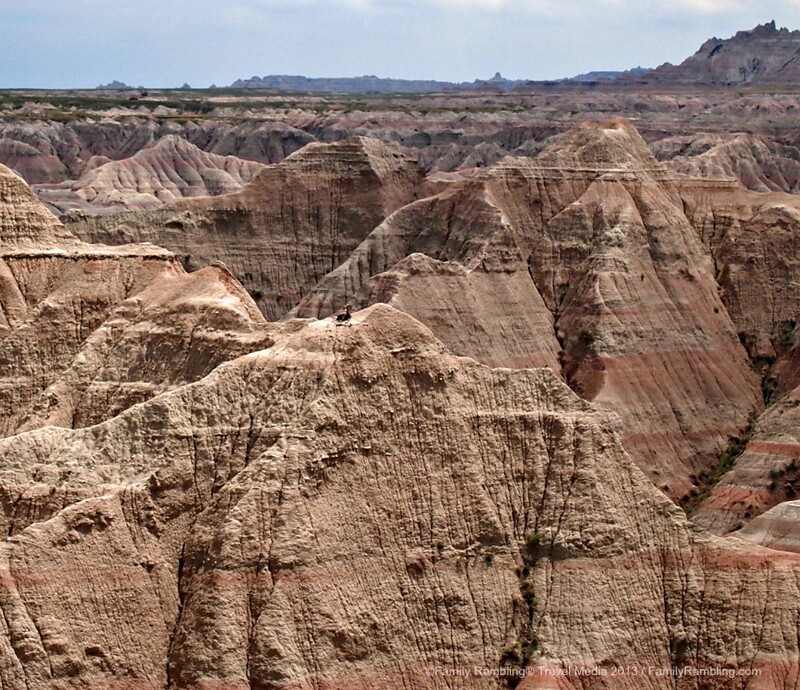 The Badlands maintain an open background policy and the entire park is open for exploration. 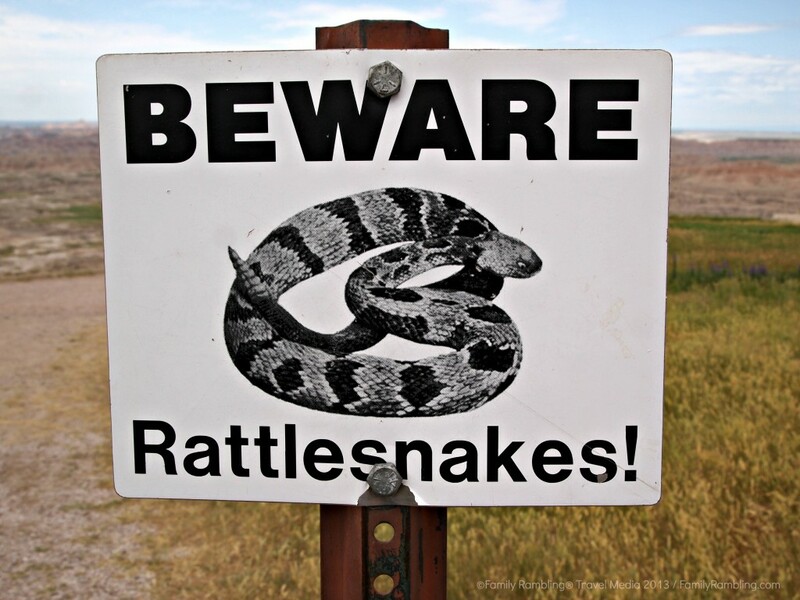 While you aren’t required to register, off-trail hikers are advised to stop at the visitor center for planning assistance and safety tips before heading out. Bluffs and buttes give way to more prairie. As you enter -or exit- the park, be sure to stop at the visitor’s center. All special ranger programs and tours leave from the visitors center. 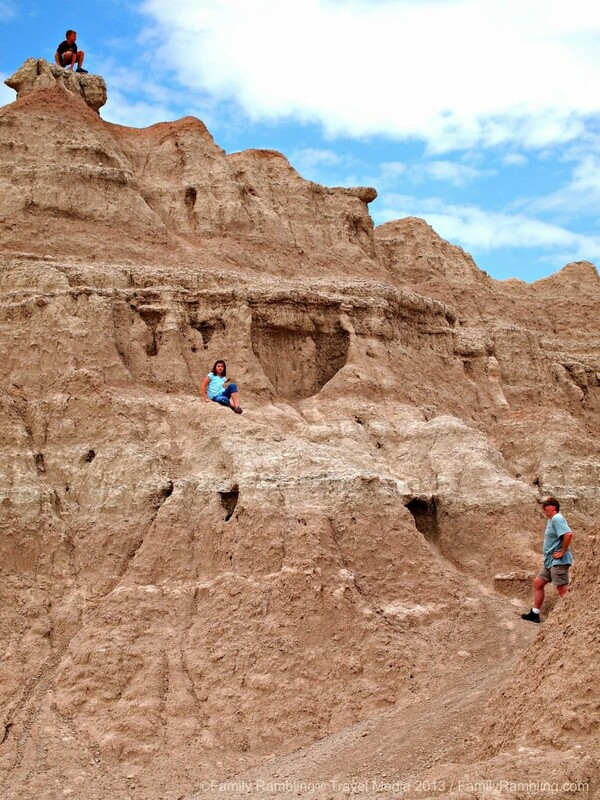 Badlands National Park also operates the free Junior Ranger Program for kids. 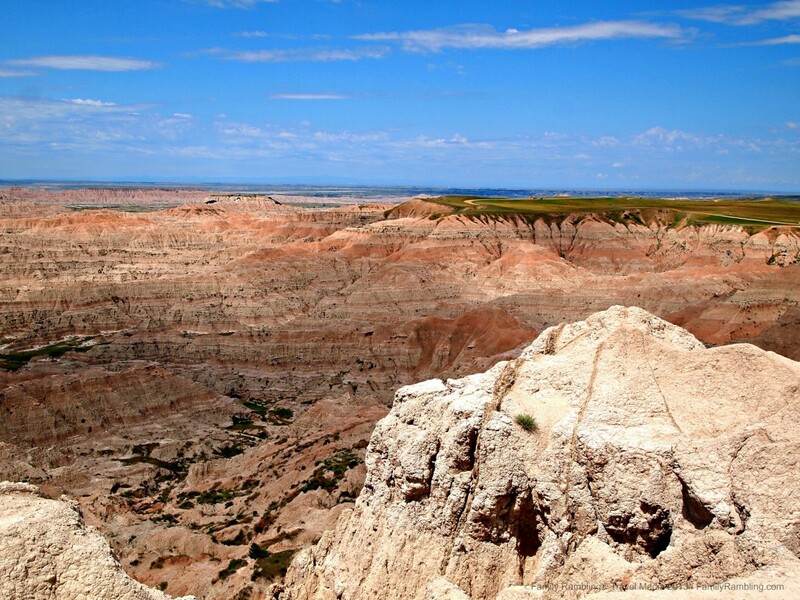 Badlands National Park has two camping areas, both in the North Unit. Sage Creek Campground, located at the west end of the park, offers more rustic camping with pit toilets but no water or electricity. Bison often roam through the campground and limited turn around is available for large recreational vehicles. 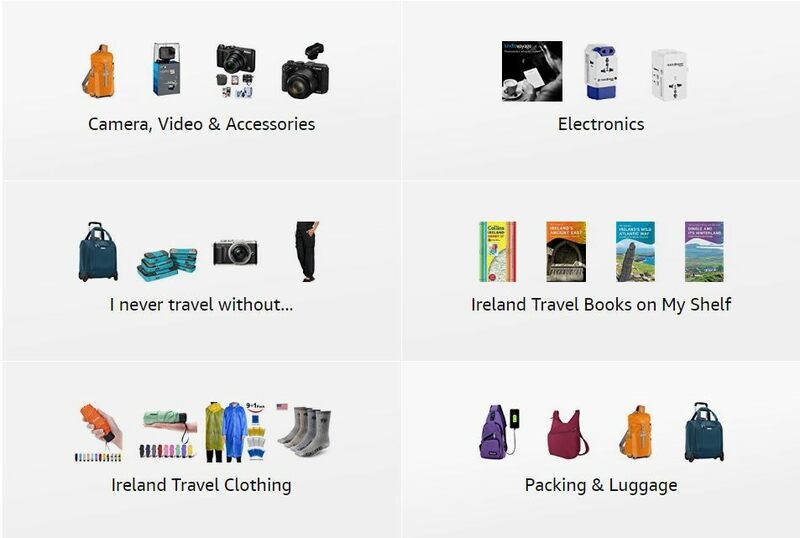 Sites are free on a first come, first served basis. This site rarely fills to capicity. Cedar Pass Campground is located near the eastern end of the park, near the visitor center. Campsites are $16 per night, or $28 for a site with electrical hookups. Cold running water and flush toilets are available here. Near the Cedar Pass Campground is Cedar Pass Lodge. Open from April to October, these comfortable cabins offer small kitchen areas, bathrooms and comfortable beds. The nearest town is Wall (home of Wall Drug), about 9 miles north of the Pinnacle entrance. View hotel options in Wall. Look closely. Do you see the mountain goat? Don’t forget your binoculars! 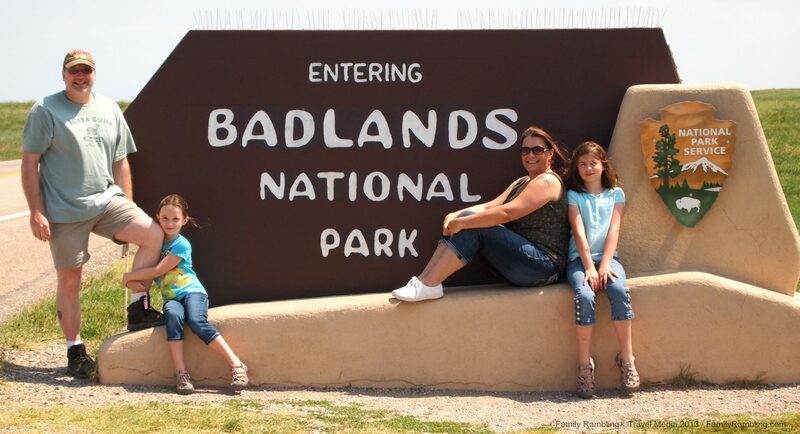 Entry to the Badlands National Park is paid per vehicle and is valid for 7 days. A private vehicle is $15. For the best wildlife views, travel the Sage Creek Rim Road. You can come into the park this way, from highway 44, continue past the Pinnacle Entrance (if you are traveling east to west), or turn west after entering via Pinnacle and backtrack. Bring binoculars. It’s the only way you’ll find a mountain goat perched on top of one of the peaks, or spot a pronghorn across the prairie. If you plan to hike, wear hiking boots. Hiking sandals are not advised.Bring plenty of water and a compass. Cellular service is spotty (or completely non-existent) in the park. Weather can change rapidly and some roads may become impassable with heavy rain or snow. 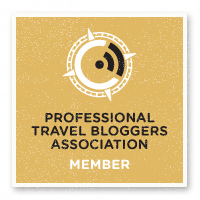 Thank you to TravelSD.com for their assistance with our visit to the Badlands.